MIAMI BEACH, Fla. (AP) — Joey Logano is the outlier in this year’s championship race. He was never in the mix for this year’s Cup title, not until he used his bumper to move reigning champion Martin Truex Jr. out of his way to forcefully snag a spot in NASCAR’s version of the final four. A week later, Aric Almirola made a similar promise because he was rankled Logano refused to cut him any slack on the track. Time and again, Logano finds himself in the center of a high-profile spat. A decade of dealing with these silly little slights, being pushed around on and off the track, has taught Logano how to tune it out. He goes into Sunday’s winner-take-all season finale at Homestead-Miami Speedway convinced he’s finally going to win his first Cup title. Logano will race Truex, Kevin Harvick and Kyle Busch for the championship. He feels as if he’s the favorite, but Logano is clearly the underdog of this group. His No. 22 Team Penske group was mediocre most of the season and an afterthought to the so-called Big Three of Busch, Harvick and Truex, a trio of former series champions who dominated the regular season. But Logano mastered a path through the playoffs and could pull off the upset of his career. It would be vindication for the driver tagged as NASCAR’s next superstar by Hall of Famer Mark Martin when Logano was just a teen waiting to turn 18 and be eligible to race at NASCAR’s national level. He was nicknamed “Sliced Bread,” because he was allegedly “the best thing since,” and the expectations were enormous by the time he made his debut. Logano is by nature happy-go-lucky, and when he made it to the big leagues, his parents traveled the circuit with him. That became a bone of contention among Logano’s peers, who resented his clean path into NASCAR and found him an easy target for scuffles on and off the track. Then he was pushed into the Cup Series way ahead of schedule because Joe Gibbs Racing, the team that groomed him, had an unexpected opening. It made Logano a target for everyone from Tony Stewart, Kevin Harvick, Denny Hamlin, Matt Kenseth and other high-profile drivers. Drama after drama would have broken some, but Logano has rebounded every time. When Gibbs could no longer wait for him to produce, he landed with Team Penske and has won 18 races since moving teams. He’s qualified for NASCAR’s championship round in three of the last five seasons, and was the favorite to win the title in 2015 but a feud with Matt Kenseth led to Kenseth wrecking Logano out of an automatic berth into the finale. He was in a spectacular crash racing Carl Edwards for the victory the next year, and a penalty kept the No. 22 team out of the playoffs last season. Logano was the first driver locked into the finale this year, despite just one regular-season victory and not showing his Ford could keep up with the Big Three. He earned his berth win a victory at Martinsville Speedway, where he moved Truex out of his way in the final turn to grab the ticket to Homestead. Truex was furious with the move, but Logano was adamant he had to take that opportunity and couldn’t risk not going for broke. Logano was booed as he took the checkered flag. Logano backed up his right to be aggressive with Truex and Almirola in last weekend’s penultimate playoff race at Phoenix. A flat tire caused him to crash out early. If Logano hadn’t won Martinsville, the Phoenix crash would have prevented him from making the finale. So he paid no mind to Truex’s anger, and even less to Almirola’s assentation that Logano should have cut other playoff drivers some slack because Logano had nothing on the line once he was locked into Homestead. “Our sport was built on tough racing and I’m going to race hard,” Logano said. “I’m a racer. That’s what I am. I’ve got one gear when I get in a race car … it’s to go win the race. To be a good race car driver, a lot of times you have to be selfish, you’ve got to think about what’s best for your race team and I think that’s kind of the approach I’ve taken over the years. He also had to deal with the ire of some of his rivals, namely Kenseth in 2015. He and Kenseth had tangled on the track various times in that season, when Logano won six races, including three straight in the playoffs. One of those wins was at Kansas and Logano didn’t need it to advance into the next round and the victory came at Kenseth’s expense. Logano was unapologetic, made no effort to make peace with Kenseth, and Kenseth retaliated two weeks later by preventing Logano from winning at Martinsville Speedway to earn an automatic berth into the championship. Logano didn’t recover and missed the final four. 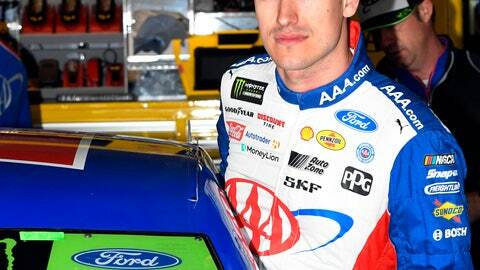 All of those altercations “make you tough as nails,” Logano said, but also matured him into the driver he is now. The problems with Kenseth were a career-changer in that Logano now understands politics in racing stretch off the track and into the motorhome lot.